Potstickers - Chinese dumplings with ground meat and veggies, pan-fried to morsels of perfection. This is the BEST and easiest recipe you can make at home. Potstickers are Chinese dumplings with a filling that consists of ground pork, shredded vegetables, and sometimes shrimp. 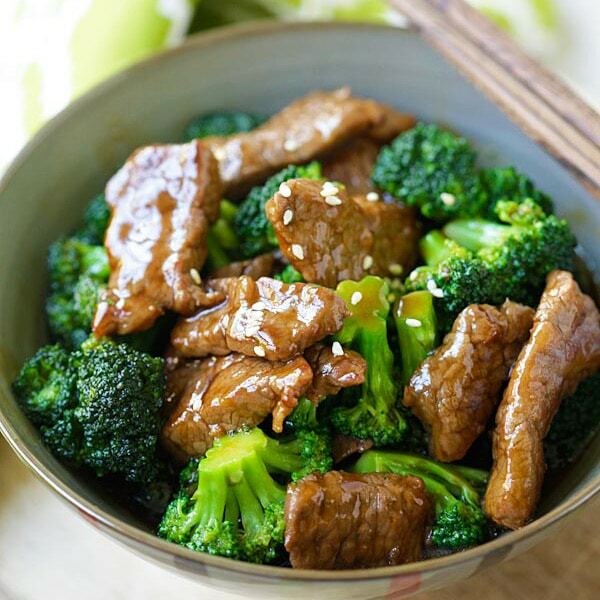 They are pan-fried and steamed at the same time so that they are moist and crispy. 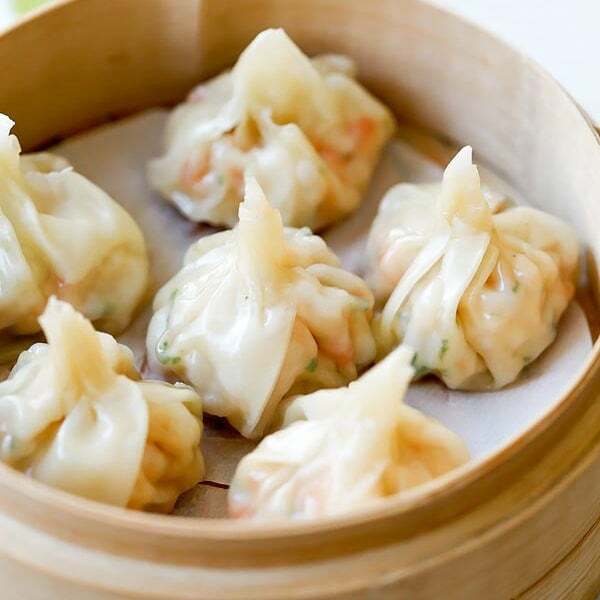 Furthermore, many people love these dumplings because they are so delicious. 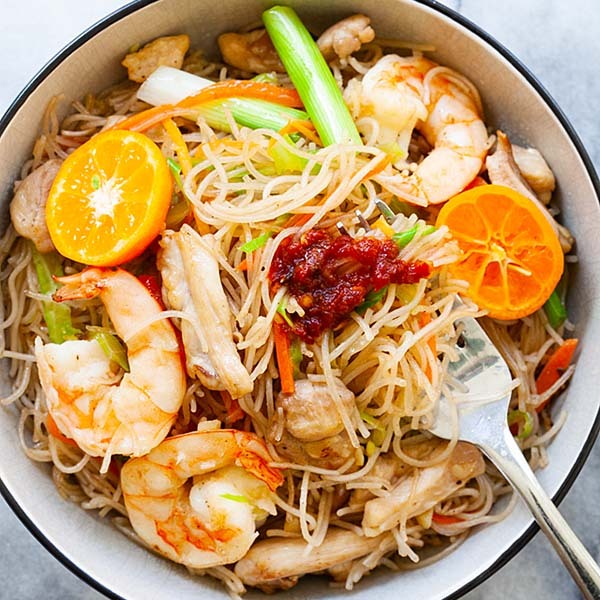 In this recipe, you will learn the tips and techniques of making them at home. 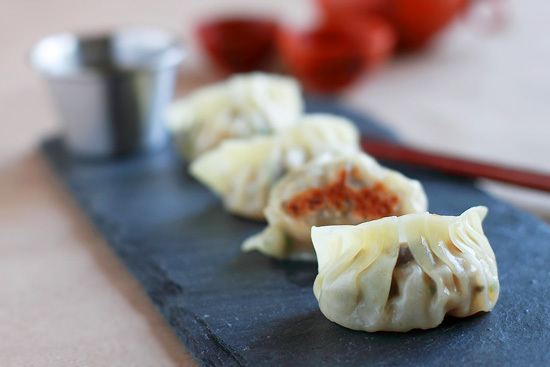 Potstickers is the direct English translation of the Chinese words 锅贴, pronounced as guo tie. Chinese cooking influences all Asian countries. In Japan, these pan-fried dumplings are called gyoza. In Korea, dumplings are called mandu. Regardless of its name and regional adaptations, most importantly, they are simply mouthwatering. Are Dumplings and Potstickers the Same Thing? While they are the same initial product, the difference is in the way you cook them. Dumplings are either steamed or pan-fried, while potstickers are both – pan-fried on one side first and then steamed. So, they are not exactly the same. Making this recipe is very easy. First, you will need potsticker wrappers that you can buy from Asian stores. Then, you will need the filling. A skillet or pan will be great for pan-frying and steaming. To wrap potstickers, check out Yum Sugar video. On the other hand, you can also pick up a copy of my cookbook “Easy Chinese Recipes” where I have a step-by-step picture guide on how to fold and pleat dumplings and Chinese potstickers. You can eat them as is, or with a simple dipping sauce of black vinegar and ginger or soy sauce. They are just absolutely delightful. Enjoy! Potstickers Recipe (Chinese Dumplings). Learn how to make homemade potstickers, SUPER easy, quick & yummy!! Mix the flour with water and knead it for about 20-25 minutes or until the dough gets soft. Separate the dough into two equal portions and roll them into cylinders (about 1 inch in diameter). Cover them with wet towel and set aside. To prepare the skin, cut the dough into 1/4 in. length and use a rolling pin to flatten it until it becomes a round skin about 3 inch in diameter. 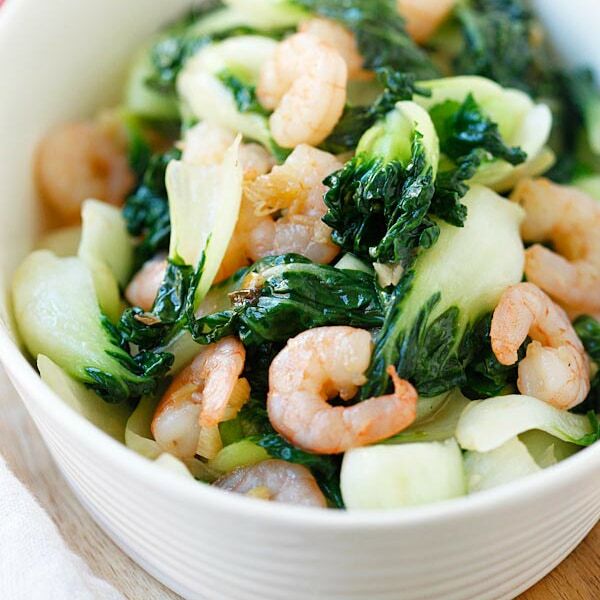 Combine the ground pork, shrimp, chopped napa cabbage and seasonings together. Set aside. To pan fry the potstickers, coat a frying pan with a little cooking oil and turn to medium heat. Place the dumplings on the frying pan and then turn the heat to high. Pan fry the potstickers until the bottoms turn golden brown and crisp. Add the water and cover the frying pan with its lid immediately. Cook until water has evaporated and turn the heat to low. Cook the potstickers for another 2 minutes or so, dish out and serve hot with Chinese black vinegar. I recently taught my son how to make them. Now I can ask him to make them when I get the craving. There are few things I can think of that I love to eat more than gyoza! Yours look and sound lovely! 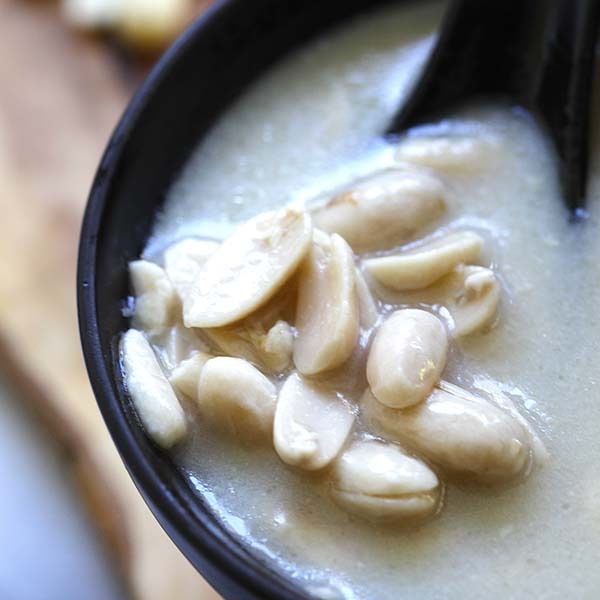 Now this one food that I love to eat during Lunar New Year. Northerners must have with lots of Chinese vinegar. Introduced to me by my niece-in-law who is from Shandong. Recipe comes in handy. I have been searching for a potstickers recipe for a while and so happy that you finally made them. Potstickers are so good, and I will try to make them at home. Thanks. They look perfect! I can never wrap these. Yummy looking dumplings…can I have one? You have a great blog going on. I am drooling here they look so yummy delicous. me and my wife love dumplings a lot. Will try your recipe this weekend. Thanks. 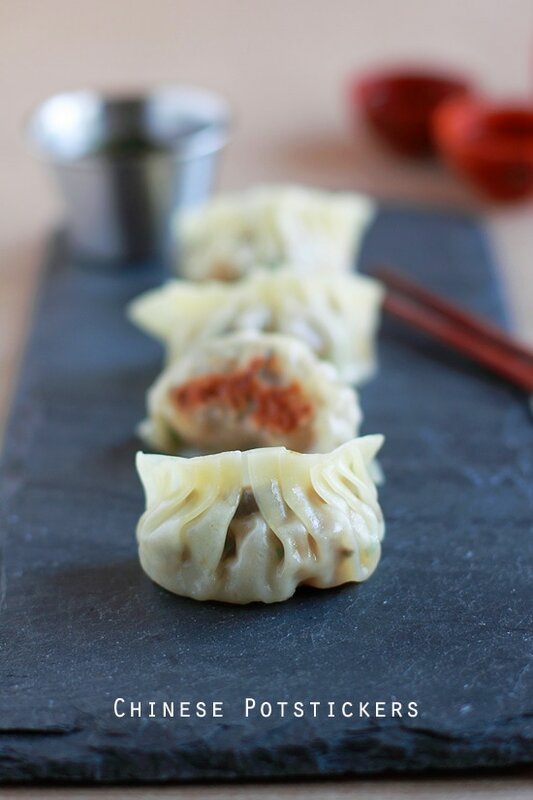 Dumplings are definitely a great Chinese tradition, not just for new year but any occassion. We don’t do this as much as Malaysia chinese but I have come to appreciate and enjoy this more each time. This is also a very versatile food which you can have it with any kind of condiments and have a completely different experience! They look so pretty. I need to go to my favorite restaurant, Gina Lee’s, and get my fix. Or maybe I’ll try making them?? Your recipe sounds easy and delicious. Delicious, I found your blog again after a long time… I better add you to my blogroll before I lose you again!!! Yummy food over here! I love gyoza and these are great too. Have never tried to pleat these.. my next to do! Found your site searching for potstickers recipe. This looks great. I wonder if you know how to make the potstickers skin from scratch? Does it make any difference to the taste of the potstickers? Hey there…haven’t come round here for awhile. Been busy, hope you are well and fine! Potstickers look good, I remember use to order these whenever we dine at Esquire Kitchen. Anonymous – yes, you can make the potstickers skin from scratch and obviously everything from scratch tastes a lot better. 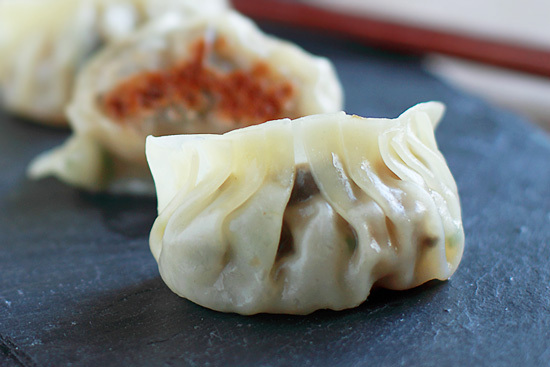 The store-bought potsticker skin is great, too, but lacks the texture. To make the skin from scratch, you can refer to Use Real Butter’s Potstickers recipe. how can i make the potstickers skin? 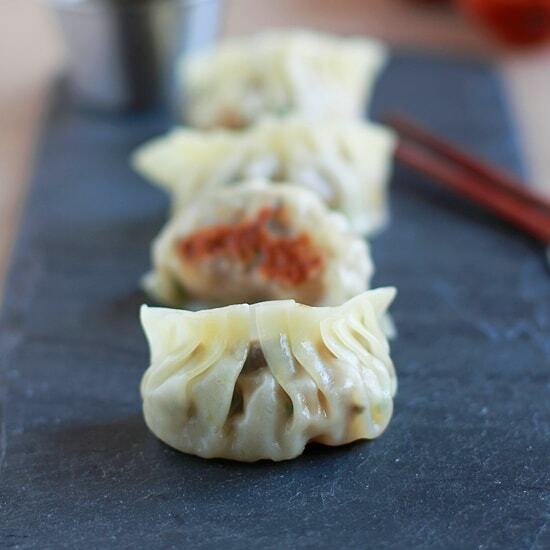 Nani – I have just added the potsticker skin recipe. Please check it out. thanks for posting the skin recipe! great looking potstickers! I just tried to make steamed dumplings but the recipe called for 4 oz of seseme oil! I put in 3 oz and it was so heavy! I tired to make my own skins but they were too thick…any tricks? Hi Will – whose recipe did you use? I certainly didn’t call for 4 oz of sesame oil. You can’t be using that much sesame oil for potstickers because it will be too overpowering. Well, for the skin, you need to keep rolling it until it’s thin. Or cut a thinner piece so it’s thinner. Hope this helps. I am hosting a murder mystery dinner party and it calls for Chinese food. I was going to either use frozen pot stickers from the store or splurge and buy some from a local restaurant. But this looks very easy and I know that homemade fresh always tastes better. So I’m going to give it a go. Do you happen to have frozen any of these? 25 is a lot for our small dinner party and I would love to make them up ahead of time for eating during the week? Has anyone frozen them, should they be cooked first or frozen uncooked? Freezing dumplings: We have a big Chinese new year party every year and make over 300 dumplings. We learned to freeze them a few years ago. We freeze them uncooked. After preparing the dumplings, we place them separated on a baking sheet on parchment paper that is floured & put in the freezer. Keep them separated until they are nice and hard. Once they are hard they can be transferred into a zip locked bag for storage. One thing we found is the dough has to be made really well or they sometimes cracked upon freezing or still stuck to the parchment paper no matter how much flour you had. It took a little bit of trial and error. Just wanted to say I tried your potsticker recipe and it was wonderful! I made the potsticker skin from scratch – the first batch took me almost 2 hours since I was rolling out each skin separately, but then my brilliant Chinese mom had idea of using my pasta roller attachment on my Kitchenaid mixer and then using a round cookie cutter to cut out the skins. It was much faster and the skin very consistent and thinner than I could roll by hand. Thought I would pass that on! Thanks for all your wonderful recipes! This looks like a wonderful recipe. I have never tried making anything like this.. so I have a few questions if you don’t mind. Since it is pork it worries me that I might not get it cooked thoroughly, how do I know the pork is cooked all through? Also, I live in the middle of nowhere…. I don’t recall seeing any ground pork. where r u all getting the ground pork from? closest I see in ground is sausage, but I don’t think that would taste good in this recipe. and lastly is the shrimp the precooked kind or raw shrimp? Thank you for your time! I recently made potstickers from the recipe printed on the store-bought potstcker skin label. The recipe included cornstarch (I forget how much). They turned out great! The last time I made them was 10 years ago or more– because that time when I made them the filling didn’t stick together at all. I’m guessing the cornstarch helps with that and now I’m sure I won’t wait another 10 years before making them again! Bee, I cannot make anything to do with dough, I’m useless. Store bought if right brand is not bad and holds up quite well. I have a little trick of boiling frozen potstickers, then broiling them on a tray instead of frying. They turn out crispy and golden brown. I’m all about saving time, too lazy to fry in batches. With the napa cabbage, do we need to add a bit of salt to draw out the water? Yes, you can do that. I usually don’t because I like the sweetness of the napa cabbage in the filling and makes the filling juicier. Gosh, this dish looks great! I love dumplings… Oh dumpling!! your wrapping skill is so good. :) Great work done! These pot stickers look great. I made pot stickers for the first time over the summer. My only problem,is that I don’t know how to fold them properly. Love your site. I made these last night and they were so tasty. I used my pasta rolled attachment to roll out the dough. It was very consistent and saved some time. My pot stickers stuck to the pan and it was very hard to get them out without tearing the bottom off. Any recommendations on how to avoid this from happening? Should I cook at a lower heat or use more oil? Thanks! Loved the recipe. We’ve made Jiaozis or potstickers every New Year’s Day since the 50’s, since my father grew up in China, the son of missionaries. It has become a fun family activity that all the family from parents to grandkids participate in. We wrap a boil (and the last few years, deep fat fry) between 6 and 8 hundred of them every year, putting them in freezer bags to be enjoyed for weeks to come. We buy the wrappers in the International District in Seattle directly from the factory. It has been a great family tradition that is looked forward to by all of our family members. Thanks for sharing this recipe! Good instructional videos! I’m sharing this post on my blog! Thank you for posting. About the word in Korean. The Korean word ‘mandu’ (만두) is a general word for ‘dumpling.’ Fried dumplings are called gun-mandu (군만두), though these are generally deep fried and stuffed with things like starch noodles. Hi, I made these and overall they were great, but the pork was oddly kind of dry. I am wondering about the fat percent in the dumplings you make. I used an 80/20 ground pork. Should it be higher in fat content to be, well, juicier? 70/30 will be ideal, 80/20 yes, too dry. Hi, It seems quite easy to make the skin. Can you freeze just the skin by itself (without filling it as I see another person has suggested) and any tips on the best way to freeze them so they don’t stick together. Can you use a stand mixer to make the dough… if so, have any suggestions on how long it should run? Also, can these be baked vs. pan fried/steamed? Many thanks ahead of time! Yes you can use the stand mixer to make the dough just knead until smooth and shiny. Yes you can bake, but they just won’t taste as good. 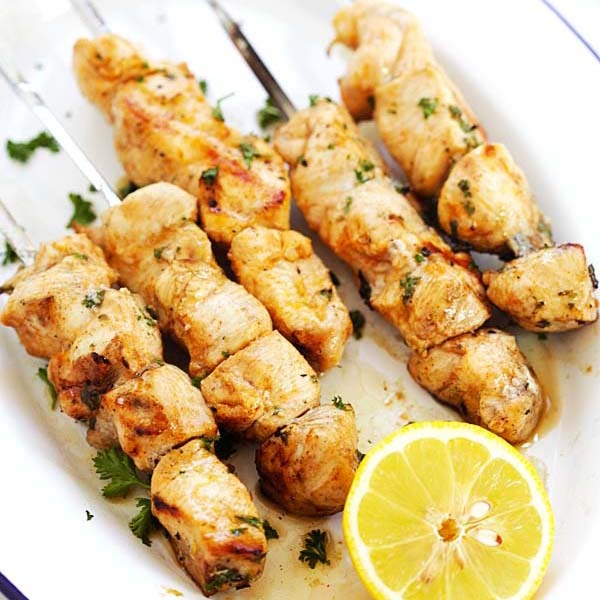 This recipe is soooo delicious and easy to make. A couple of handy hints is to have your wrappers at room temperature to make for easier wrapping and your meat needs to have some fat included to have a moist product – lean meat makes a dry potsticker. Dianne, correct, perfect ratio of fat and meat is 30:70.